SGBox Singapore Math Curriculum For Kindergarten / Preschool First Year (Beginner) is a rigorous, comprehensive, integrated and modular Singapore Math curriculum package designed to provide your child with an intensive, thorough and first class math education, so as to ensure they get a huge head start in math over their peers. 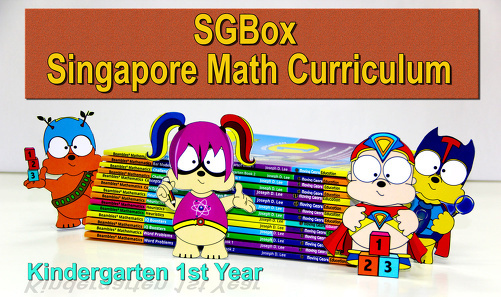 SGBox Singapore Math Curriculum For Kindergarten / Preschool First Year (Beginner) consists of a carefully selected variety of excellent Singapore Math books that will maximise your child’s learning and mastery of math and help them build up a solid foundation in math. With this Singapore Math package, your child will master essential mathematical concepts and skills, math problem solving skills and math critical thinking skills; develop confidence in solving fundamental math questions; and grow to love math. Hassle free online shopping. Delivery is fast & packaging is good. Books are well structured & very relevant for the targeted age group. ONG Y. K.
To SGBox staffs: I received the parcel last Friday September 24... the books are great. The kids liked it and so do i. I would surely recommend your books to my friends here... Thank you. Til next order again. V. D. V.
Hi, I receiced my order today. Thanks very much. When I open the box this afternoon, my 4-year-old daughter cannot wait to start working on it. Your books really got her interests. C. M. C.
Graded activities, lots of practice. Children love the activities and stickers. Dedicated and meticulous service. C. W. H.
The math books I received are very age appropriate. The material is challenging enough to keep my daughter thinking while still keeping her confidence level high. The workbooks are presented in a fun, colorful format that is very enjoyable for my kindergarten student. K. G.
I like the way that you set out the work, it is really easy for my chlidren to understand. God Bless keep up the work A. N. L.
Dear sirs, I ordered Singapore Math for the kindergarden 1. My daughter likes the books very much. As soon as she saw them she wanted to start. Greetings from Mary-Ann Mac Leod. My children, my wife and I love SG box. My children work with these books everyday and the results are amazing. We have recommended to our family friends. Great job SGbox team. M. A. V.
I think this is a great system and I believe it should be used in all schools everywhere. B. A. This is an email to let you know that we have recieved Our order. Thank you for the speedy delivery, the packages arrived two days before scheduled. After reviewing the order, we are very impressed with the quality of both the books and the service. again thank you SGBox And Thanks Mom and Dad! Joe B. My order arrived much faster than expected and in perfect conditions. The books are colourful and engaging from my 3 year olds. They love specially the jelly beans and want to answer everything related to them. I will soon engage my fifth grader in your curriculum as well. M. M.
Was satisfied with the books. My child is enjoying doing the activities from the books! S. T.
Straightforward and easy! Delivery was spot on. Thank you. J. S.
Good service and fast delivery S. W. L.
I was happy with the delivery and the conditions of the books. S. N. M.
Products were good. Y. Y. Experience was good. C. P. J.
Thank-you! The materials are great! C. M.
I have received my package which is in good condition. P. D.